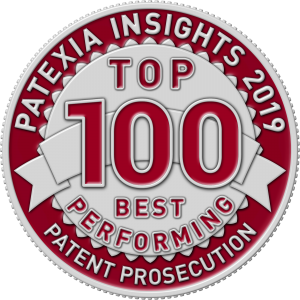 Patexia Insights has ranked Nicholson De Vos Webster & Elliott LLP amongst the top 100 Best Performing Patent Prosecution Firms Overall and top 100 Best Performing Law Firms in High-Tech in the recently published 2019 Patent Prosecution Intelligence Report. Patexia evaluated over 5,000 law firms based on their performance in the areas of success, efficiency and activity. Information regarding this report can be found on Patexia’s description page here: https://www.patexia.com/ppr_2018_badges.html.